Danielle and Evan’s engagement session still has my heart a flutter. We spent our time together exploring Fourth Presbyterian Church on the Magnificent Mile in downtown Chicago, a spot of significance for the lovely Bride. The weather was a bit chilly and sort of dreary but it couldn’t stop these two from enjoying the experience. Their adoration for one another is apparent the second you lay eyes on them and also very moving. It also doesn’t hurt that they are both gorgeous and Danielle is quite the fashionista either. 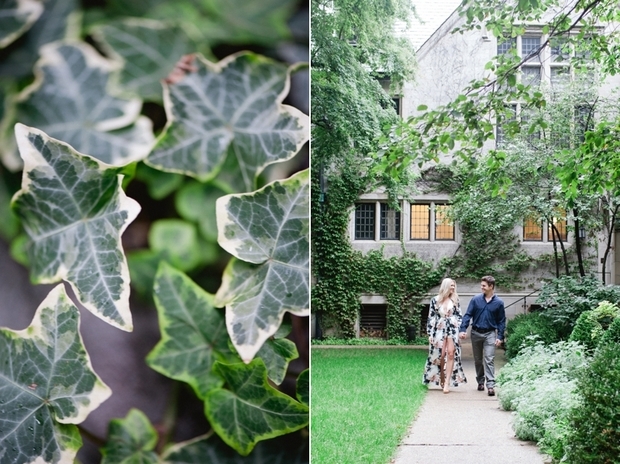 After exploring the charming ivy covered nooks of Fourth Presbyterian, and hiding from raindrops under beautiful arches, we headed over to North Ave beach where Danielle and Evan shared a toast to their engagement. These two cuties were such a joy to photograph and I am BEYOND excited to capture their W Hotel wedding next summer.